Anyone who works with forest dwellers across the world asks themselves the following question at some point or another: Can community forests be a viable alternative to industrial logging? If so, what form would this alternative take and is it achievable? This question may seem simple at first glance, but that is not the case. This document seeks to analyse this question in the hope of clearing up the debates and discussions between Fern’s various partners. 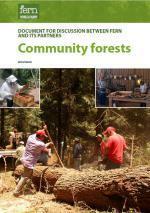 The document was drafted based on discussions and input provided during a workshop organised in Brussels by Fern on 3rd and 4th April 2014, and as such is based on community forest experiences in Nepal, Mexico, Guatemala and Cameroon. The document also takes into account the concerns of participants from other countries, (Vietnam, Laos, Congo, Democratic Republic of Congo (DRC), Gabon, Liberia) and various other studies. The report will systematically make reference to the workshop’s case studies and detailed minutes, and will refer the reader to them for further information. 1. To outline what various forms of community forestry have in common whilst identifying the specificities of each one, and to highlight how they help (or not) to reach the objectives that we have set for ourselves. This review will examine the legal, economic, political, institutional, anthropological, cultural, geographical and environmental aspects. A comparative study of several case studies – although not exhaustive in nature – will highlight their similarities. 2. To discuss the thought processes and various stages that will be necessary for community forests to be a success on different spatial scales, at the local, national and international level. 3. To contribute to developing tools for advocacy in order to convince decision makers of the advantages of community forests or the need to change the dominant economic system in a more comprehensive way. Our objective is to develop the skills of users so that they can become part of these processes and put a stop to the more negative and dangerous phenomena for the human groups that they wish to assist and strengthen. In order to do this, it is important, from the outset, to give a frame of reference on the realities observed in the past by highlighting the evolutions and contradictions, and by identifying, where possible, breaches and blockages. There is no single solution that can work in all situations, or for all types of stakeholders. Giving up on the myth of a ‘universal model’ is now one of the conditions of success. Let us be clear that this in no way means giving up on the will to change what it appears must be changed, regardless of the challenges that must be faced in order to do so.